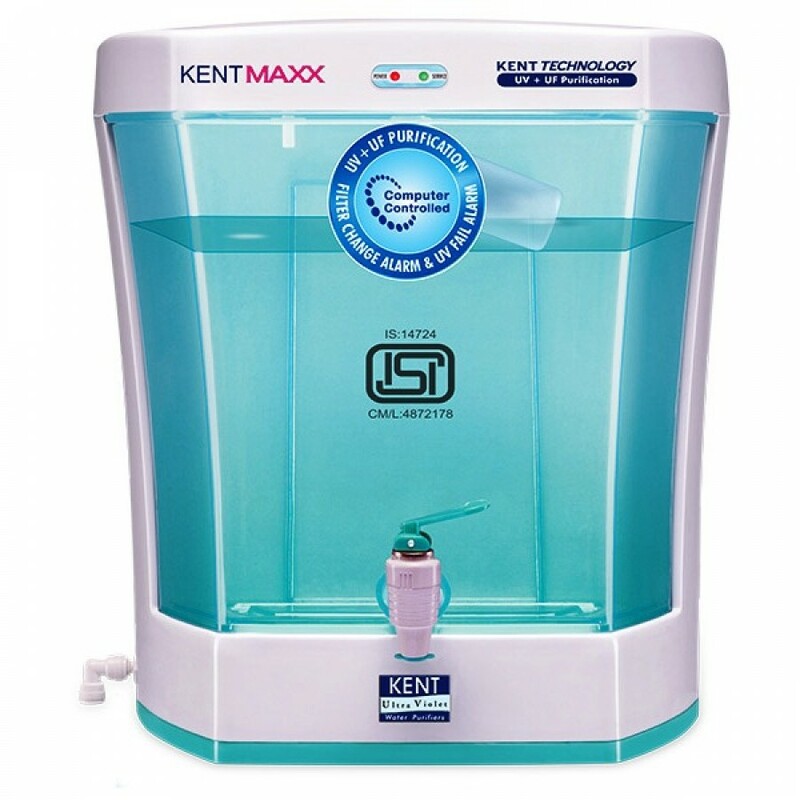 Kent Maxx UV Water Purifier is India's only UV water purifier with detachable storage tank that provides double purification first by UV followed by hollow fibre UF membrane. This purifier is designed for wall-mounting, best suited for tap/municipal water supply and domestic purposes. In this purifier, double purification happens first by UV, followed by hollow fibre UF membrane to completely filter out dead bacteria, viruses and cysts, thereby providing 100% pure, safe & tasty drinking water, which is ideal for consumption. Designed with excellence, KENT Maxx comes with a storage capacity of 7 litres. The detachable storage tank is also easy to clean on-site without the need of any technician. The model has a transparent cover that makes it visually appealing. The Activated Carbon Pre-filter in the purifier reduces bad taste and odour providing purified water that is healthy, tasty and safe to drink. KENT Maxx does not remove dissolved impurities and hence is suitable for use where inlet water, like tap or municipal water, that have low TDS (Total Dissolved Solids). This water purifier is tested and certified for its performance and quality by world's renowned laboratories, such as the WQA (USA & India), NSF (USA) and ISI (India). These achievements guarantee that KENT not only gives the most purified water but is also trusted by millions.